This 6 piece set of Cocktail Spreaders combines the easy elegance of Nocha.The finest quality hostess serving utensils. They are brightly polished that never needs polishing and made of 18% chrome for maximum corrosion resistance. Dishwasher safe for easy cleaning. Perfect for special occasions or daily meals. Limited lifetime warranty. Nocha pattern is a clean sleek modern design. Have a shiny mirror finish. 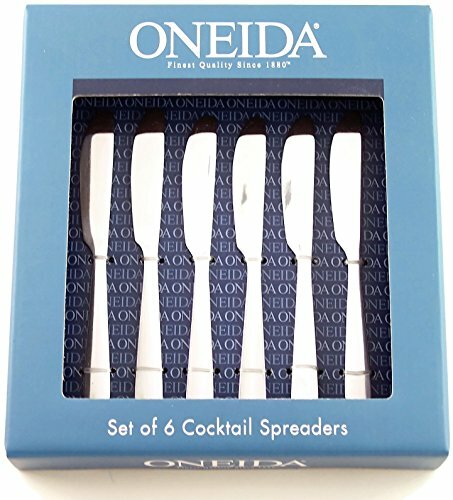 A pack of 6 Cocktail Spreaders. If you have any questions about this product by Oneida, contact us by completing and submitting the form below. If you are looking for a specif part number, please include it with your message.